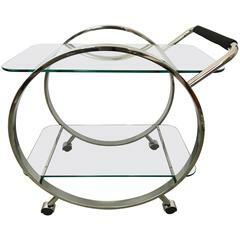 Bar cart designed for multiple purposes, as a bar cart with small wheels, as a bedside table or maybe an entrance piece. 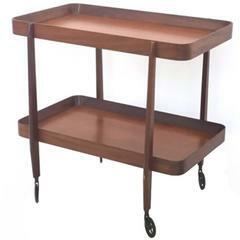 The bar cart can easily be carried when folded. Gorgeous and rare piece of furniture. 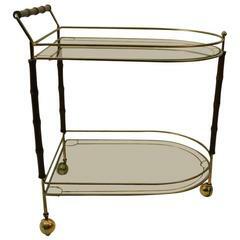 Midcentury vintage trolley made of brass with glass shelves. The top shelf can be used as a glass trey. Good vintage condition. Hans C Andersen Danish design turn teak table on a tripod base, 1950s. Marked underneath. 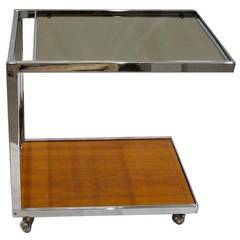 Very nice bar cart with tubular gold colored metal / mirror glass / smoked glass. It is in good condition but has some normal age related signs of wear and fading.